FAQs - How do I ...? 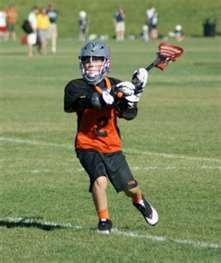 Boys's lacrosse is a contact game played by ten players: a goalkeeper, three defensemen, three midfielders and three attackmen. The object of the game is to shoot the ball into the opponent's goal. The team scoring the most goals wins. Positions - There are four positions on a team. Goalie: The goalie's responsibility is to protect the goal and stop the opposing team from scoring. A good goalie also leads the defense by reading the situation and directing the defensemen to react. A good goalie should have excellent hand/eye coordination and a strong voice. Quickness, agility, confidence and the ability to concentrate are also essential. Each team has one goalie in the goal during play. A lacrosse field is 110 yards long and can be from 53 1/3 to 60 yards wide. The goals are 80 yards apart with a playing area of 15 yards behind each goal. The length of the field is divided in half by a center line. An 18 ft. diameter circle is drawn around each goal and is known as the "crease." A rectangle, 35 yards by 40 yards surrounds each goal area and is known as the "goal area." An "X" is marked in the center of the field. There is a special substitution area on the sideline, next to the timers table. Access field diagrams below for a clearer picture. goal. This line becomes known as the goal line. Attached to the goal is cord netting, which is fastened to the ground 7 feet behind the center of the goal. Become a better lacrosse player by watching Players, Coaches, Trainer, and Referees sharing their Lacrosse knowledge! great way to improve your game. 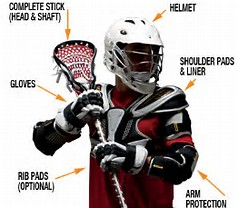 Each player is required to have a lacrosse stick, gloves, shoulder pads, a helmet, arm pads, and a protective cup. The game is played with a solid rubber ball 7.75 to 8 inches in circumference and weighs 5 to 5.25 ounces.